Geisha, Ariel, Colgate and Guinness are among the top Fast Moving Commodity Goods (FMCG) brands in Kenya. In a recurring monthly mobile survey conducted by GeoPoll on household essentials from October 2014 to date with an average of 3,000 respondents per month, the report provides some interesting insights on advertisement recall, frequently purchased brands, and brands consumers would not consider buying or recommending. Data is not just available for Kenya, but all of our markets. Contact us if you’re interested in ourFast Moving Commodity Goods (FMCG) data. According to our survey, Kenyans buy bath soaps more frequently than they do toothpaste or washing powder. 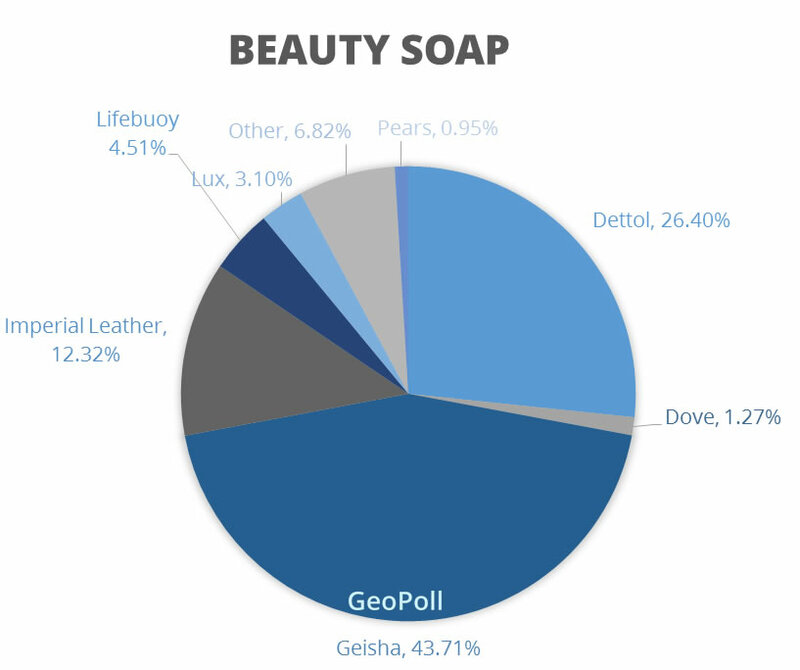 Geisha- beauty soap brand from Unilever has been the leading brand for a while now (as far back as our survey data goes). They control 44% of the market with Dettol coming in a distant second with a 25% market share. Interestingly, 27% of respondents last month (September) indicated that they would not consider using Dove soap. Also, amidst the ongoing aggressive marketing campaign by Imperial Leather, the brand has been a distant third with an average of 12% market share. Colgate remains the number one toothpaste in Kenya controlling over half the market at 54%. Aquafresh has been a distant 2nd place capturing only 16% of the market. Ariel has for a while now dominated the washing powder market, however, what’s surprising is the next brand that has been steadily rising eating into Ariel’s market share especially in urban areas. Sunlight though at a distant 2nd position, has been growing at a fast pace and reducing Ariel’s market share. Interestingly, when it comes to washing powders, most of the respondents indicated ‘None’ when asked which powder they would not consider buying. As of March this year, Nice & lovely found a formidable opponent in Movit – a new kid in the hair treatment block. Movit is from Movit products Ltd in Uganda. Nice & Lovely, an indigenous Kenyan company was acquired by L’oreal in 2013 and despite this significant change in ownership placing the Nice & Lovely brand in the globally players league, this has not prevented the company from losing out its market share significantly. As it turns out, those weird ads by Movit peaked the interest of many Kenyans. Movit has been competing neck to neck with Nice & Lovely in the hair treatment category as of March his year. As at September this year, Movit and Nice & Lovely had an equal share of the market at 28.1% with Dark & Lovely coming in a distant 3rd. Although Afia by Kevian Kenya continues to dominate the Juices market after taking on Delmonte which has a foreign shareholder majority, Delmonte had, in the month of February this year, recaptured its lead. It steadily dipped thereafter and continues to do so. The surprise card in this category is Quencher which sprung from an being an almost non player in July this year to the third position ahead of Minute Maid and Pick n’ peel in the months of August and September. Tusker is no longer Kenya’s top beer brand, and has not been for quite a while (This is according to the Geopoll data, that goes back to Aug 2014). Diageo’s global brand, Guinness has been the most consumed. The highest peak for Guinness was in April this year with a 40% market share. Interestingly, Guinness had the highest consumption among women in January this year at 52%. However, From May – August this year, most women switched to Tusker then switched back to Guinness last month(September). Among men, Guinness has been consistently the drink of choice. GeoPoll’s Retail Measurement Service delivers daily data on key performance indicators of Fast Moving Consumer Goods (FMCGs), including awareness and market share of brands and availability of products in the market. This service is the first of its kind in emerging markets and provides valuable local knowledge which allows FMCG brands to better understand the needs of their customers. The Retail Measurement Service provides accurate market intelligence in real-time, allowing brands to immediately track trends and compare their performance to competitors’ in the same space. Data is displayed through an interactive, easy-to-use online dashboard, enabling anyone to interpret results and make data-driven decisions. GeoPoll’s Retail Measurement Service currently includes top brands in several categories, and can be customized based on client needs.